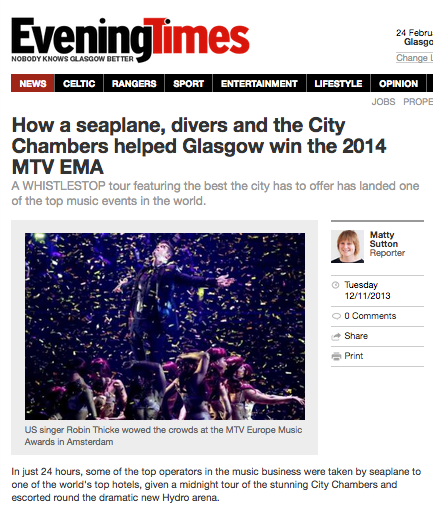 The MTV EMA Awards come to Glasgow - with a little help from the seaplane ! Earlier this year we received a call from the team at the Glasgow City Marketing Bureau (GCMB) asking us if we were available to fly from Glasgow's City Centre - they couldn't give us any details as it was very, very confidential but having worked extensively through the years with the great people at GCMB we're used to that approach at LLS. On the day of the flight everyone was introduced by their first names - we were still no wiser. The departure from the River Clyde in Glasgow's City Centre was, as always, magnificent and the flight out to the West Coast was incredible. As our guests were mainly from the USA we also flew over locations such as the Holy Loch, where the US Navy operated submarines during the cold war, and the town of Greenock where 1.3 million US soldiers went ashore from the Atlantic convoys in 1944 to fight in Europe. Visibility was fantastic and our passengers enjoyed stunning views of Islay, Jura and Mull. Leaving the coast behind the seaplane flew over the Arrochar Alps to the north of Loch Lomond before turning south past Ben Lomond. Finally, the seaplane flew over the islands marking the Highland Boundary Fault before splashing down in front of De Vere's five star Cameron House Hotel - a truly wonderful experience. Our passengers disembarked on the pontoon in front of Cameron House for lunch and until this week we were still didn't know who our VIPs were. The hosting of the event in Glasgow was announced at this year's MTV EMA awards to 700 million viewers worldwide ..... the mystery is over .... our front seat passenger earlier this year was no less than Mr Robert Bakish the President and Chief Executive Officer of Viacom International Media Networks. A fantastic result for Glasgow and a massive well done to Scott Taylor, Joe Aitken and all the staff of the Glasgow City Marketing Bureau.